Egypt's interim administration has formed a judicial committee to investigate a deadly clash in Cairo at dawn between the army and Muslim Brotherhood supporters in which dozens were killed. A statement by the transitional administration said the deaths were the result of an attempt by protesters to storm the Republican Guard headquarters where President Mohammed Morsi was being held after his dismissal last week. 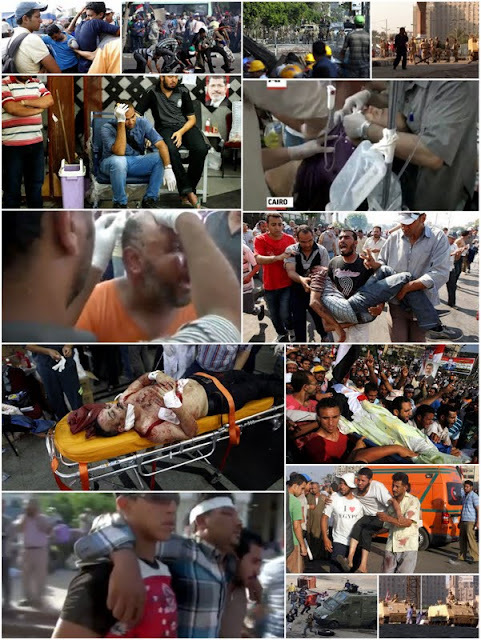 At least 50 people were killed in the clashes, which Muslim Brotherhood demonstrators blamed on the military. There are two opposing versions of the incident. The military claims there was an attempt to storm the compound by "armed terrorists" at dawn, forcing the guards to return fire to repel the attack. The Muslim Brotherhood says a detachment of soldiers advanced from behind on hundreds of people performing dawn prayers outside the compound. Liberal politician Mohamed ElBaradei said Egypt was in "dire need" of reconciliation and condemned all violence. Former presidential candidate Hamdeen Sabahi, leader of the Popular Current party, told Reuters the transitional administration created when the army toppled Morsi in response to mass protests against him and the Muslim Brotherhood could not afford to wait. The appointment of a prime minister has been held up for two days because the ultra-conservative Islamist Noor Party rejected both secular candidates for the post nominated by army-backed interim head of state Adly Mansour. Sabahi said it was important to have Islamist participation in the transition but he believed that Noor might revise its position and either join the government or join in the rewriting of the constitution once a new administration was formed. Asked about Monday's clash outside Republican Guard barracks, Sabahi said the only beneficiaries of such bloodshed were the Muslim Brotherhood and others who sought to polarize the situation and drive Egypt to civil war. Each of the two Egypts is accepting no less than everything. Muslim Brotherhood supporters feel their legitimacy was robbed. They won’t leave the streets and public squares before Dr. Mohamed Morsi is reinstated. Masses opposed to the Brotherhood regime believe Dr. Morsi flouted the principles of his popular democratic mandate and reneged on his campaign promises. As a result, he lost his legitimacy and had to be removed. Neither side can tolerate the other and it is difficult to imagine them sharing governance of the country. I am certain normalcy won’t be restored and bloodshed won’t stop in beloved Egypt except when each of the two sides gets totally convinced it cannot manage the country’s affairs alone. During Morsi’s rule, the Brotherhood did not believe the opposition existed and the opposition refused to cooperate with his administration. The central figures of (Mubarak’s) National Democratic Party were booted out after the January 25, 2011 revolution. The central figures of the National Salvation Front were sidelined by the Morsi administration. We’re now at the stage of sidelining the Muslim Brothers. That’s a vicious circle that can lead us nowhere except to madness, death and ruin. What makes the situation catastrophic is the decision by the Muslim Brotherhood and its supporters to resort to violence and street fighting as a counter weapon against the revolution, the army and the new regime. A party to the current conflict that believes it can politically or physically finish off its opponent is misguided. This sick mentality leaves no chance for a transition from utter disconnection to national cohesion. Remember the army’s public and secret ultimatum to Dr. Morsi was meant as a goad to a political partnership between his administration and the opposition. But exclusivism pervaded the Brotherhood’s approach and the former president’s conduct. The Muslim Brotherhood, heartened by the Americans, committed the memorable blunder of believing that taking to the streets to recoup the former regime is the only way to win this power struggle. No one will be able to shut out the Muslim Brotherhood. And the Brotherhood has no chance of putting back the clock. We will continue to destroy each other and the state of political folly and lawlessness will refuse to go away.